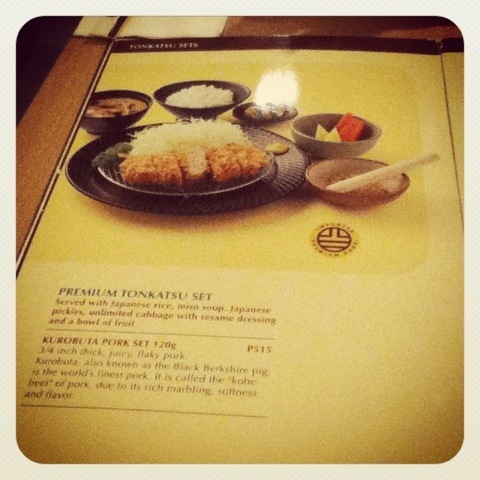 My brother was telling me about this Katsudon place in Megamall, Yabu. So, after a long day of work, Hubby and I decided to give it a try. Pardon the pictures as I left my Canon S95. Pictures taken using my iPod. 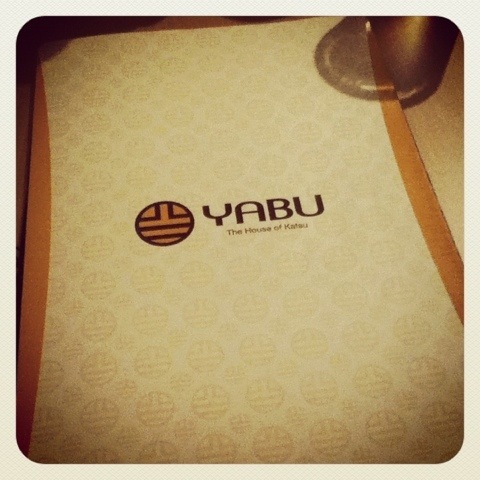 Yabu is located at the 2nd floor of Megamall’s Atrium. It claims to offer the best Katsudon in town. It has a minimalist interior and its walls are lined with Comic type design depicting of a sensei teaching this kid how to make a good Katsudon. 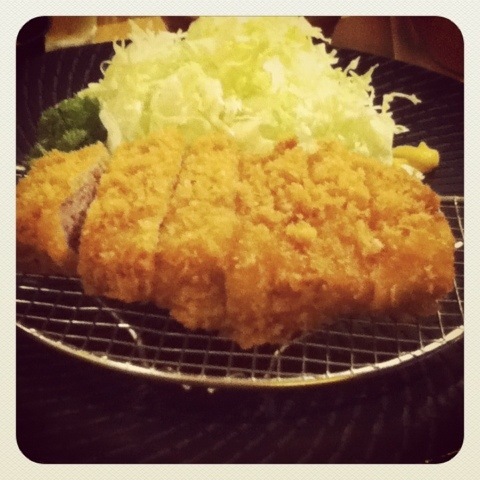 My brother recommended the Kurobuta which is supposed to be their premium Tonkatsu set. As you can read from the menu page I’ve taken, Kurobuta is “also known as Berkshire pig, is the world’s finest pork. It is called the ‘kobe’ beef of pork due to its marbling, softness and flavor.” Hence, with that description, I gave it a try. Most of their sets came with unlimited cabbage, fruits, miso soup, Japanese pickle and Japanese rice. Their condiments are tasty. I liked both the vinegar and sesame dressing on my cabbage. 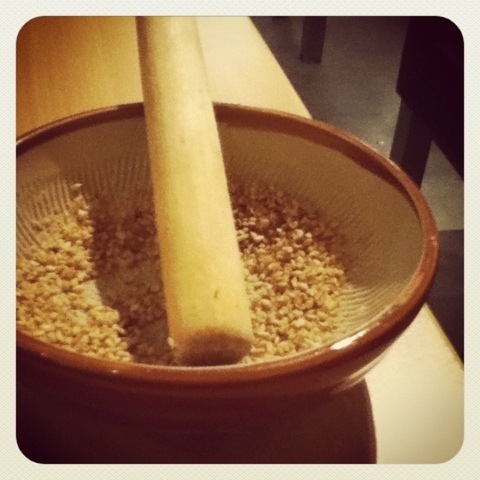 This is interesting – they gave me sesame seeds to mash and to mix with the Tonkatsu sauce. The meat was delicious. It was soft and tender, crispy on the outside and soft on the inside. However, maybe it was the fatty in me as I would have preferred one with more fat as the Kurobuta was too lean for me. 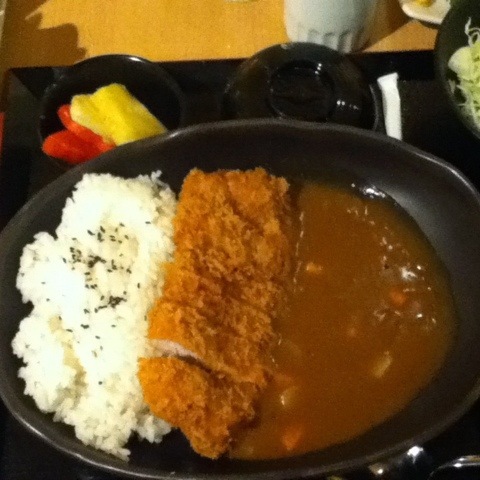 On the other hand, Hubby ordered their Rosu Curry. The meat had more fat in it which was better suited to my “fat” liking although I wasn’t in the mood for curry. 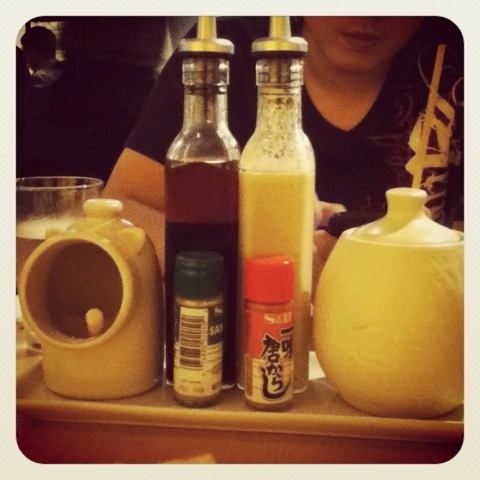 All in all, the food at Yabu was good. 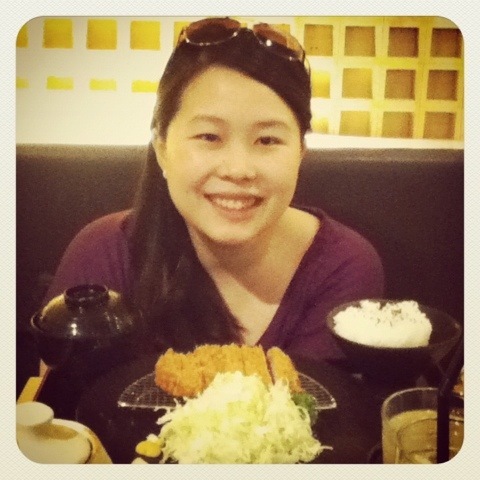 I haven’t tried Saboten in HK and couldn’t compare it with that restaurant. However, I’ve tried a Katsudon place in Japan and Yabu still has a few miles to go before it matches it. 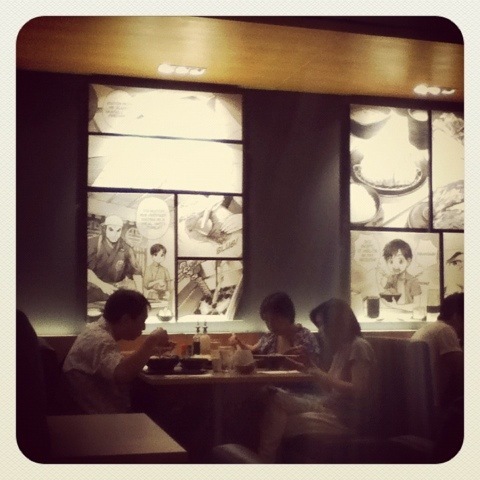 However, overall, comparing it to the katsudon available here in Manila, this place is worth going and trying out. I love how the place was designed. I also like the different Yabu shirts on the waiters. Very artistic! Will definitely come back to try out their Tonkatsudon, Hire, Chicken Tonkatsu and other food on the menu.